ok I ammit I dont ride saddleseat. But I do park out Promise. I have a pic of him and I was wondering if you saddleseat people could tell me how it looks. Nice stance. Hind legs are a bit too far behind but that looks like where they need to be to level the topline. 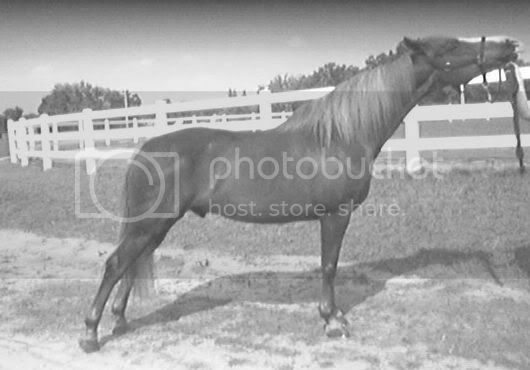 However, if you step back farther away from the horse and raise your hand with the lead up much higher you might get a better stretch as well has more arch in the neck and the ears up too; then you would need to get the hind legs a bit more forward. Horse has high withers and I am wondering if he's not a bit low in the back? No offense meant by that, I have a gelding that is high withered and a bit low backed. So what do you do with this nice horse? My gelding does Country Western Pleasure and the Pinto mare I have shown in another post on this forum my daughter shows Hunter Pleasure, Country Western Pleasure and Open Pleasure Driving with. Peppy...you never want to stretch the front legs out in front. They should be perpendicular to the ground or only slightly in front of that. The last thing you want your horse to resemble when parked is a bridge! When stood up from the ground you actually want the horse stretched up and over the front legs without them ending up past vertical; under saddle you still want those front legs as close to straight up and down as possible. It doesn't matter if it's a Morgan, Saddlebred or TWH. In everyone's opinion does this one look better? I like the stretch and higher head better but the front legs are almost but not quite past vertical (can't complain though) and it's hard to see but it almost looks like you're holding your horse's head up. Try to get your horse to arch up and then reach for you so there's a nice curve in the throat latch. My daughter was reaching for the Pinto mare but normally she's standing further back with some backward tension on the reins and holding something like a peppermint to entice her with :)Have fun with that nice horse! Are you walking your horse foward into park or setting him up by backing his hind legs into place first? VERY nice horse Frannie and I am COMPLETELY jealous of the scenery!! As LauraS and SaddleseatQueen have said you want your horses front leg perpedicular to the ground and his hing legs stretch out behind him wherever it makes his topline level...he is perfect in the first picture as far as leg placement. If you can get his head up (I usually jerk the leadrope once quickly and that usually does it) then get him to stretch and reach forward he WOULD be perfect. Plus getting his head higher would hind the dip just in front of his withers where his neck ties in. Look at the pinto mare LauraS posted...she would be perfectly parked out if her handler were to step back and allow the mare to reach just a bit more. Peppy...Ideally a horse in park should never has his front legs just in front of him...this is OK and most likely wouldn't get dinged for it but if you want perfection a horse in park should be "centered" over his front legs! Gorgeous, just as long as his ears were UP! !